A couple of times in the Travelling Hat's journey, the participants have taken photos and sent Adelaide on, but have been too busy to post about it right away, so we have a catch up today (and one more hopefully to come too!). Karlie contacted me when the journey was underway, hoping to be able to take part, and we managed to make room in Adelaide's USA schedule. The more the merrier, right? 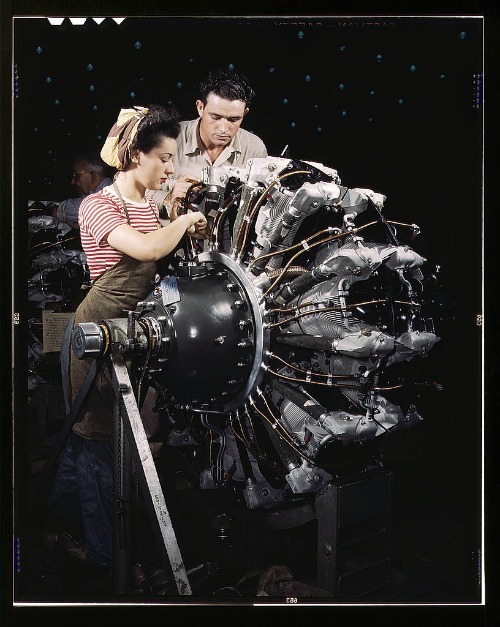 See more over at Karlie's blog, United States of Vintage. 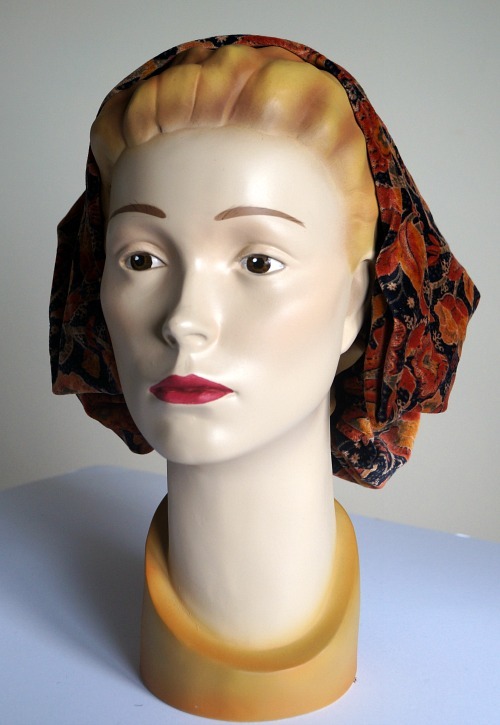 If you see a modern girl dressed in vintage style wearing a snood, you'll probably see it by itself, adorned with hair flowers or a simple bow. 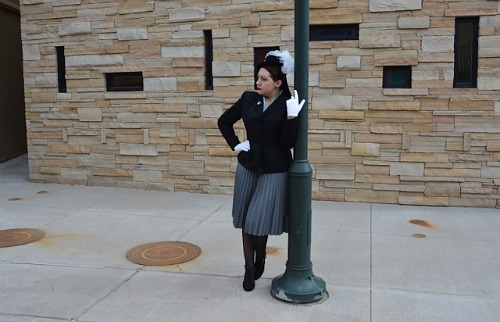 Back in the 1940s, you might just as often, or perhaps more often, have seen it worn with a hat, or as part of a hat. 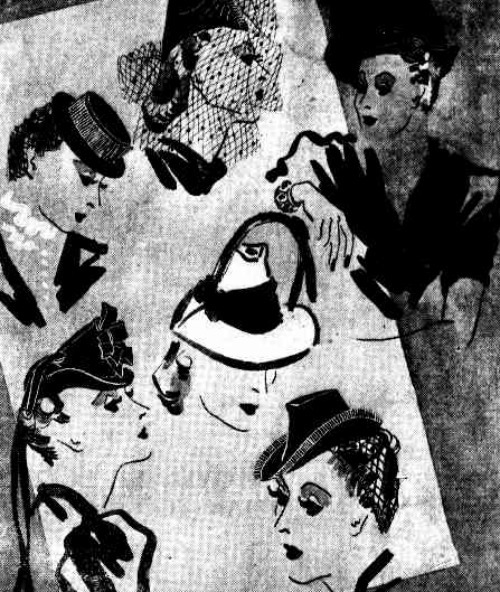 I don't know what was seen most on the everyday woman, but based on the magazine images, snoods with hats were in the majority! Sometimes the snood would look pretty much the same as the ones we are used to - a knit or crochet covering for the hair - just with a hat worn on top as well. But the hat-accompanying snoods would also stretch our understanding of what a snood really is. 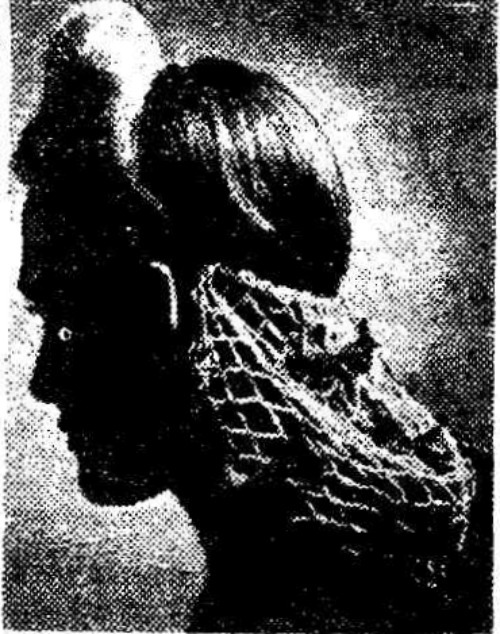 Sometimes the look of a snood was created with some net or veiling that simply fell over the back of the hair, without actually enclosing it. Sometimes the snood might be what is holding the hat to the head, as a more decorative alternative to a simple elastic. These snoods might go over the hair, but not enclose all of it, perhaps leaving curls out at the bottom. Let's get some inspiration from the archives. 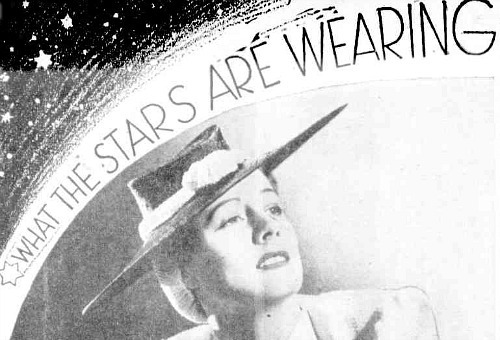 Irene Dunne is the star in question, and she's wearing a black and white outfit, with a black straw hat and a snood made of her dress material. 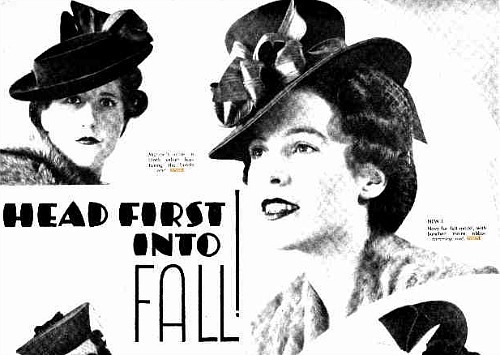 The article states that the snood help keep the tilted hat on firmly, as well as holding in the hair. Also, "The pill box, the tri-corn, the glengarry, the coachman hat and the sailor, all take kindly to the addition of a snood." 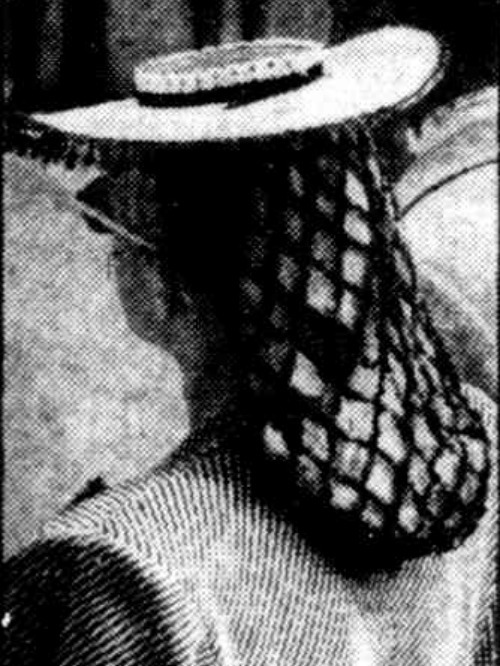 A bit of street-style photography from the forties, this straw hat with mesh snood was seen in the crowd at Wimbledon. Two mesh snoods among these hat looks, making their appearance in the Autumn collection at David Jones. 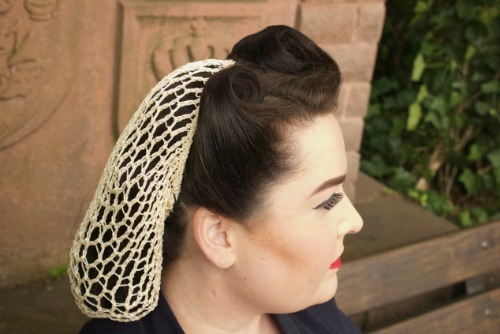 Suggestions for touching up last year's pillbox hat include adding a mesh snood that sticks out "provocatively". This snood is covering most of the hair, but notice the curls at the side. Again, the pretty curls are out at the side of the head, but the rest of the hair is inside the snood. 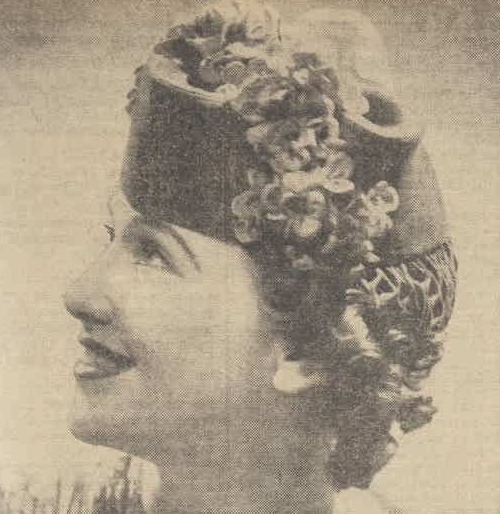 Here the snood is showing curls at the bottom, so while it would keep some hair in place, it is probably mostly serving to hold the hat in place. The hat, by the way, is in the shape of the ace of clubs, and I can't tell you just how fabulous I think that is. 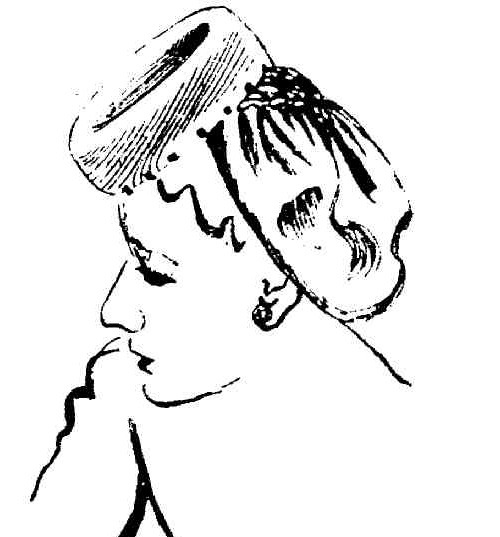 This hat is described as having a snood, but as you can see, it looks more like a drape of veil giving a snood-like effect. Beautiful either way! So, it's a bold look for modern times, but be brave and give it a try this week, the last week of Snoodtember. I think we can all agree the look is stunning! It's sewing time! If you haven't picked a fabric yet, read the recommendations in Part One first and also get some extra inspiration there. 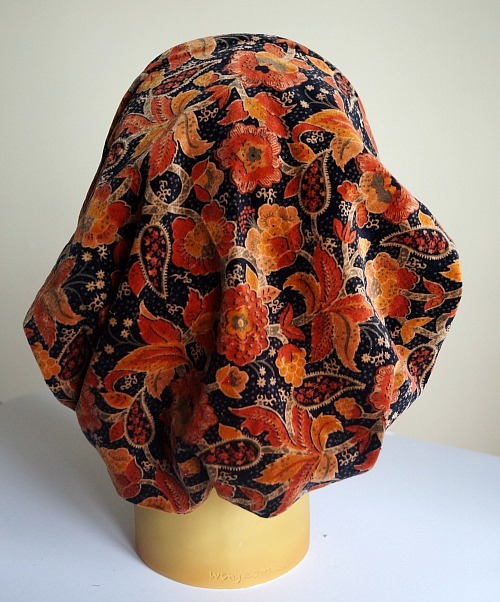 This pinky-red velvet was my test snood, but I didn't take pictures as I went, so now I'm using a paisley patterned velvet/velveteen from an old skirt (it was already cut apart and damaged when I got it) for the tutorial photos. First we need a pattern. 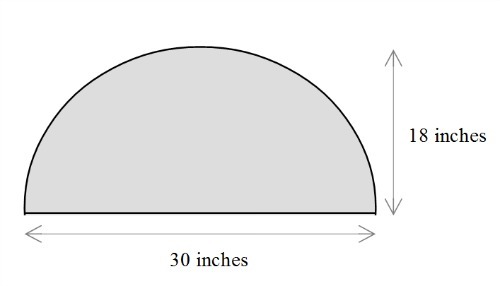 The shape is a sort of half-oval with a base of 30 inches and a height of 18 inches. Mark out those lengths then join them with a curve by hand. Your pattern should look something like this. Honestly I've cut mine straight onto the fabric, but you may wish to draw it on paper first. Now we begin by sewing the channel for the elastic. 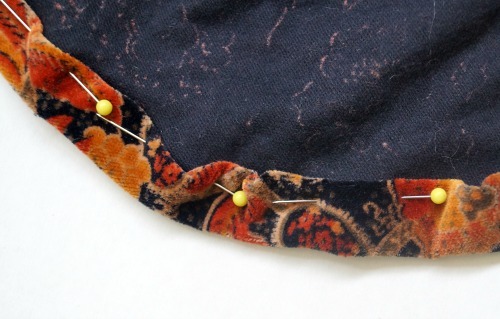 Fold the fabric over twice along the curved edge and pin in place. At the curviest sections, you will need to ease the fabric as you go. It will end up gathered, so don't worry too much about the neatness. Sew close to the inside edge of the fold. 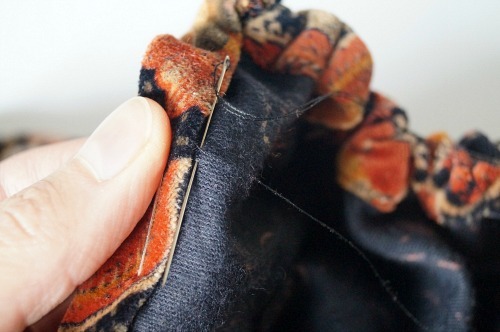 Cut your length of elastic (about 10-15 inches) and sew one end by hand to one end of your elastic channel. 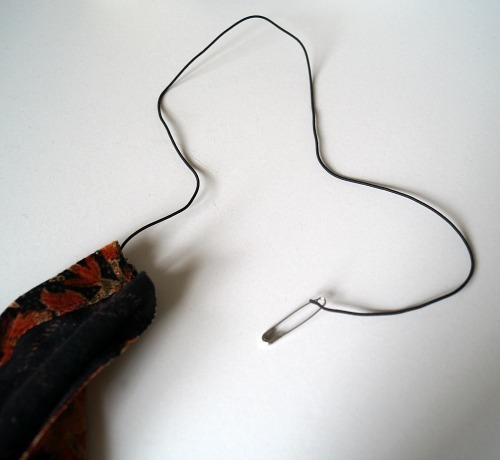 Attach a safety pin to the other end of the elastic. Feed the safety pin through the channel until it emerges at the other end. Pull on the elastic to gather up the fabric. I pretty much gathered it as much as I could, but judge for yourself if you want it a little looser. 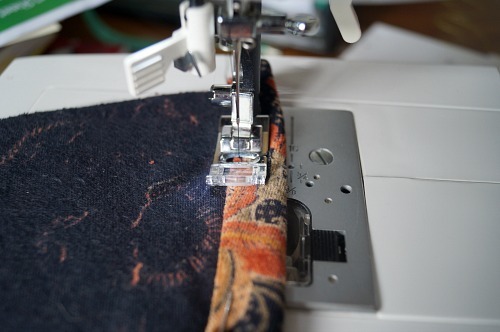 Once you are happy, sew the elastic in place at the end of the channel and cut off the excess. Now we will finish the front edge, the straight edge. Depending on your fabric, you could do this by machine or by hand. 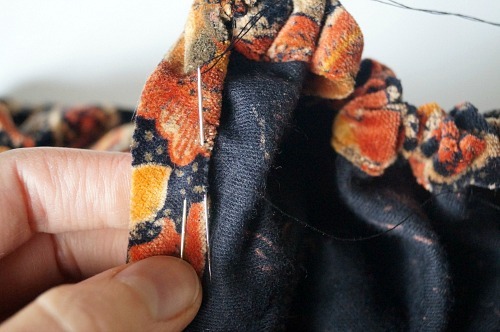 Fold the edge into a double hem again and sew. To sew by hand, take a long stitch through the hem followed by a short stitch through the single layer, trying not to let the stitch show on the outside. The front edge is too long as it is, so it needs to be looped under. It helps if you can pin the snood onto a mannequin head to do this step. Fold about 4 inches under at each end. Pin into place, and sew with a few hand stitches. And that is that! Your snood is complete. I do like it as is, but it would look great trimmed with a bow or worn with a hat (which is next week's theme and is going to be so much fun!). 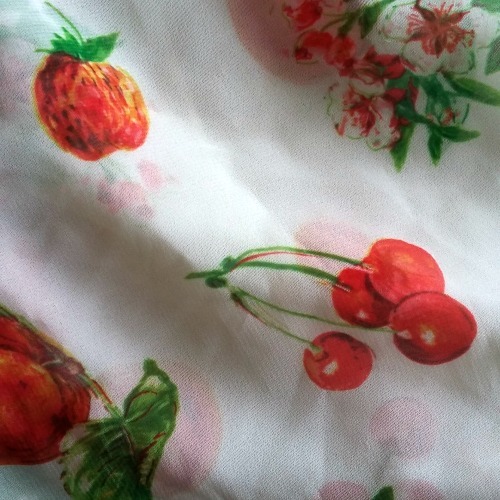 This particular fabric gives it more of a sixties or seventies look, doesn't it? It's a pretty fabulous fabric. I'm just going to stare at this for a while, then I might make one out of a chiffon-type fabric and see how it goes. Good luck making and I'd love to see what you create! The travelling hat is back in Australia! I am so excited. She is just a couple of stops from home now. Lately she has been visiting a very lovely lady, Bonita, of the blog Lavender and Twill. It was Bonita who suggested the hat's name, Adelaide, so it was a special meeting for them I am sure. Bonita certainly did the occasion justice with this stunning outfit and beautiful photos. I love the dark blue and the bright red. Dreamy. Head over to Bonita's blog post to see more of these gorgeous images! Unfortunately, I do not have a lot of pretty inspiration images for you today! 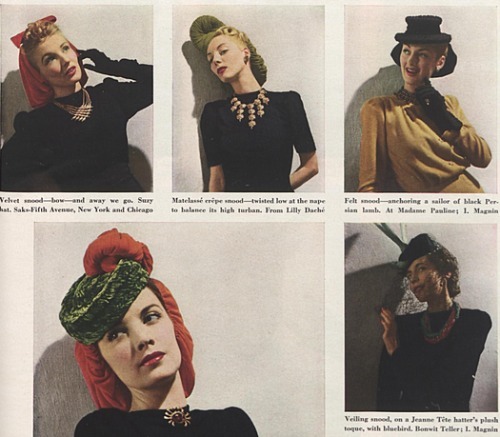 Although the 1940s were keen on novelty fashion items, with quirky prints on dresses, embroidery and appliqué, wacky knitting and crochet patterns, wild hats by the likes of Bes-Ben, and of course jewellery on some surprising themes, I haven't seen much in the way of novelty snoods. The only one I'd call novelty is this pompom covered snood (thanks to @misssabrinafairchild on instagram for drawing my attention to it). 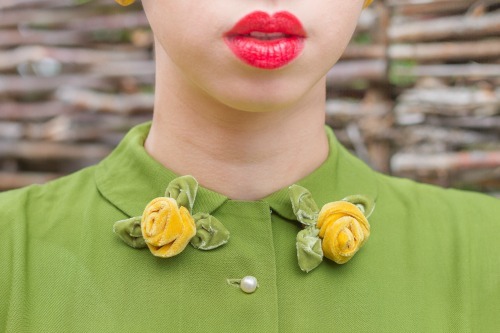 While adding a flower or bow to your hair, why not add a novelty brooch? Nestle a cute animal in amongst the petals and make your novelty statement that way. All kinds of jewellery bits and bobs could be useful. 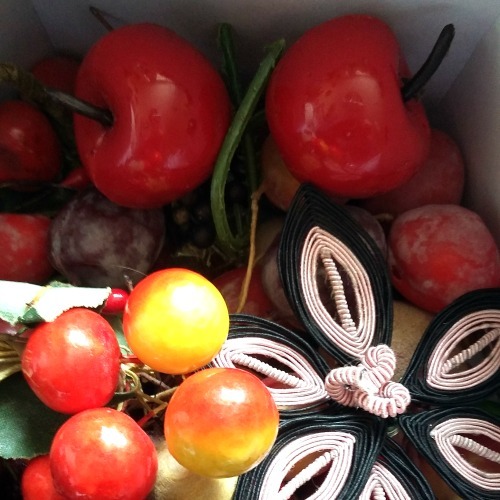 Don't forget your millinery fruit - always a good option too. And if you are wearing a snood at Christmas time - go nuts! You can take just about any ornament off the tree and make it work. 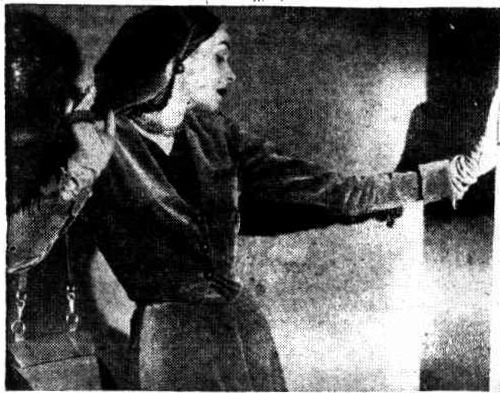 "Ornamental daggers, clips and gay brooches can be used in any further number of experiments." Challenge set: ornamental daggers, people! If you are doing the snood-along, you could look for a novelty fabric to use. I have something I've been saving just for this occasion and I'm looking forward to using. Or, if you have a novelty-print scarf, tie it into a scarf snood. Just as I did with my year of whimsies, I'm planning to bust out the felt and scissors and get some cute animals on my snoods! 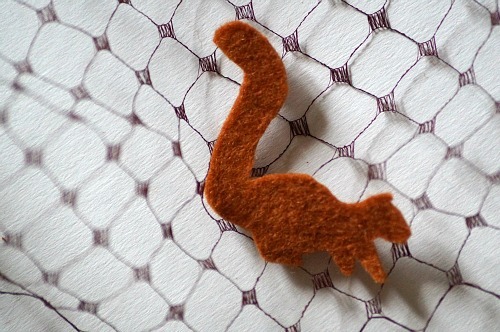 Cut some felt shapes and quickly stitch them on to your snood. If you aren't feeling that crafty, look out for little novelty buttons that could do a similar job, and don't forget the pompoms! Maybe a Halloween snood with little pumpkins and orange flowers at the front? Or a baking snood with little cookies? Now I'm getting excited!! What novelty ideas do you have for this week? I admit this is going to be my favourite. I've been missing my novelty since the whimsies ended! Having already had the fun experience of creating a custom hat for Nora, I jumped at the chance to work with her again. This time we wanted to design a small collection that would be available to others rather than just a one-off hat. 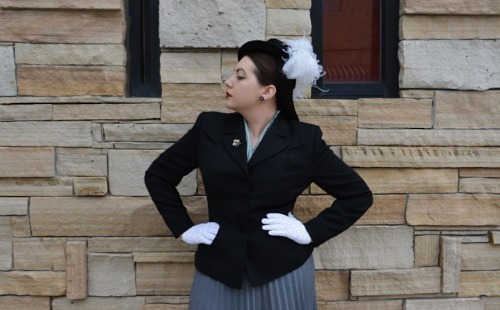 Our initial goal was a 1940s-style tilt hat that could be worn by women with short hair, and the collection grew with other pieces to complement that one. Many design iterations were cycled through, as is often the case, but the final collection is here at last! This is the tilt hat, in brown wool felt with a velvet band. The lush velvets are through all the pieces, as are the velvet ribbon flowers. 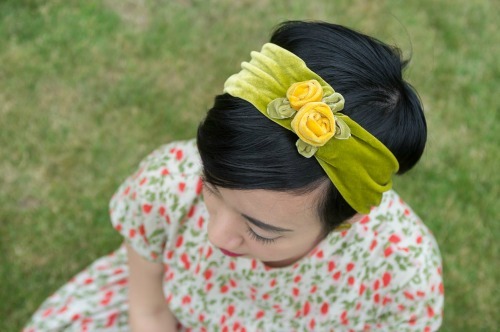 The green velvet headband is again topped with velvet ribbon flowers, and has elastic at the back to help the perfect fit. These ribbon flowers are mounted on little clips that are suitable as dress clips, as shown, or shoe clips (or adding to a headscarf or similar). 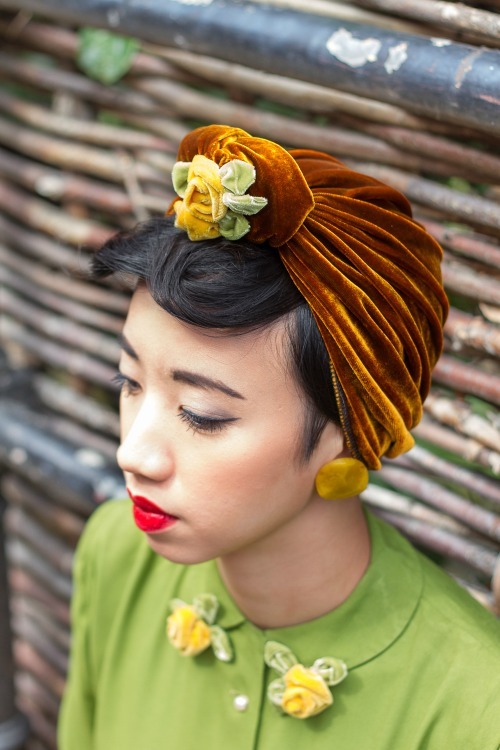 My favourite is the draped turban in glowing amber velvet, with ribbon flowers at the front. The designs are limited edition, and are currently available in my Etsy shop. If you haven't checked out the posts from Nora showing off her outfits, I highly recommend you do so as well! In other news, I have written two guest posts lately. 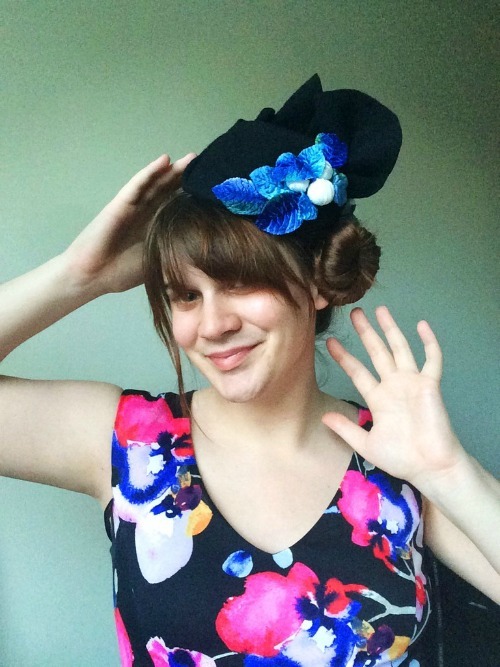 At Zella Maybe, you can find my tutorial for refashioning a cheap straw hat into a late 1930s tilt hat with a scarf and on Chronically Vintage I share my advice for choosing and using free vintage hat patterns. I hope you enjoy them! 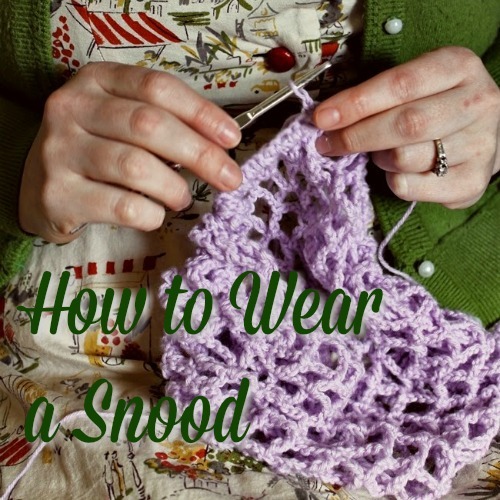 Are you ready for the snood-along? 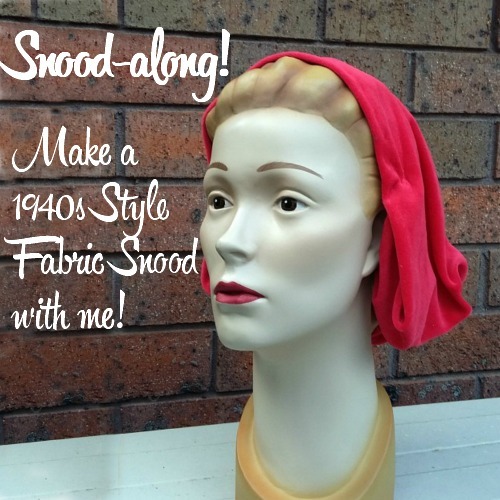 Join me in making a 1940s style fabric snood. It's really quick and easy! This is the snood we'll be making. Today we're going to talk about fabrics, so that you can find something suitable, and look at some period inspiration images too. As you can see, I've made this from velvet, but there are lots of fabric options. Your fabric snood is all about drape and gathering. So look for a nice drape in your fabric. It can be light and flowing, like chiffon, or heavier, like a jersey or velvet. You will obviously make your choice based on the season and the outfits you plan to pair it with, and the occasions you will wear it to. 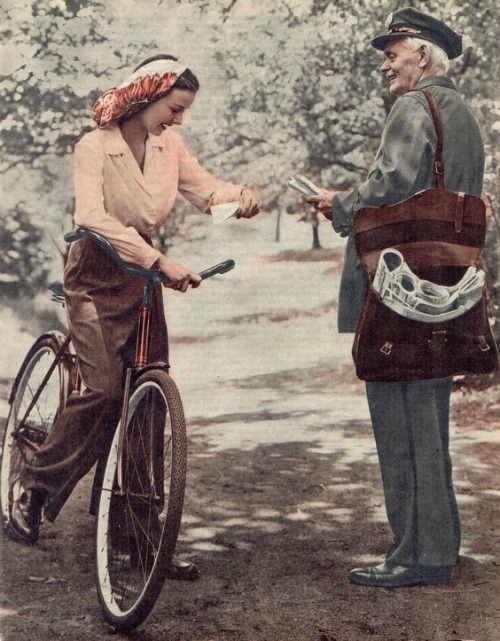 If you have any clothing you have made yourself, making a snood out of the leftover fabric was common and popular in the 1940s. Some vintage examples that I found mentioned include a chiffon snood to match a swimsuit, corduroy to match a winter suit of the same, fine silk for 'afternoon wear' in summer, and wool jersey with a chenille pillbox and winter dress. You will need a 30 inch by 18 inch rectangle, but a little less in either dimension is fine, it will only alter the fullness of the snood (and it is pretty darn full). You will also need matching thread, and about 10-15 inches of elastic (preferably round, but any fairly thin elastic should be fine). There ends up being only about 8 inches of elastic in the snood, but having more makes threading it in a lot easier, and you can then adjust it to a point that you like. 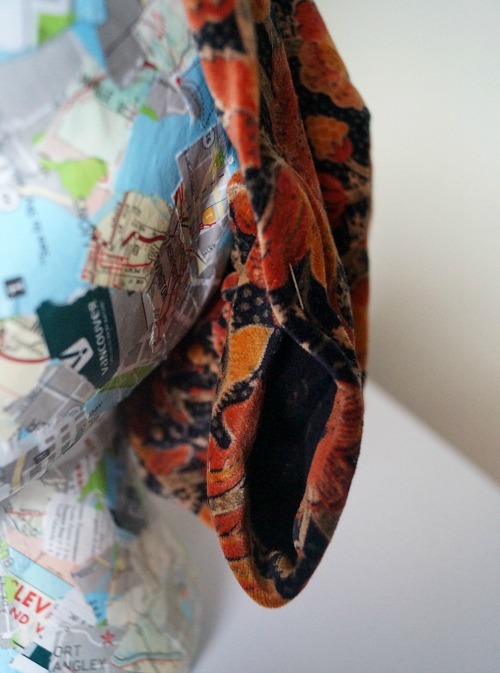 I've based my fabric snoods, and the patterns and instructions I'll be sharing with you, on the instructions from How to Make and Trim Your Own Hats by Vee Powell. I have changed it since then, since I didn't find it to be quite right for me. It was too voluminous, attached to a hat foundation, and didn't gather enough to actually keep my hair in, as well as more-or-less requiring the trim they suggested. My version is closer to being a fabric version of a crocheted snood, designed to be worn by itself, to hold your hair in, and to be trimmed by you however you want. A lot of the fabric snoods I found in vintage images were worn with hats, and I've included some of those here, but I tried to focus on those where the snood is the main player. The text for the bottom left image above describes the snood as "capacious as a knitting bag", but it's the top left that is most like my snood in the end. I might have to add that bow! These two images look to me like they might be scarves tied as snoods although the one below I'm not as sure of, especially because of the bow. For instructions on how to tie a scarf as a snood, see Casey's tutorial. I fell in love with this snood the moment I saw it, and her whole outfit is fabulous. The snood interests me as it isn't completely closed over the head, but almost so. I wish I could see more angles! 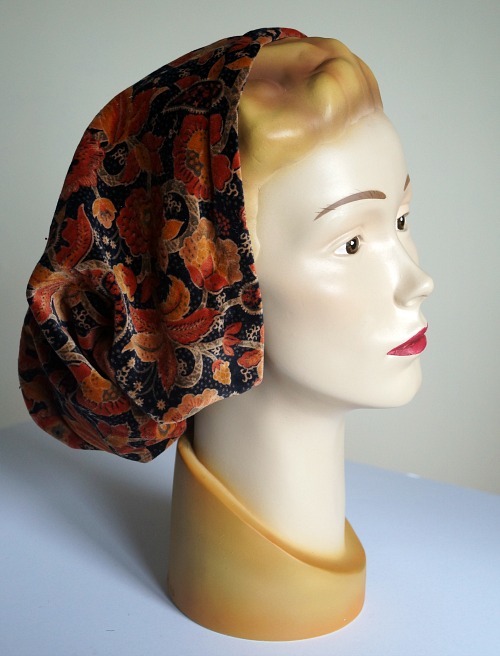 One of the noticeable features of some fabric snoods is that they have gathered details at the back, like this Lilly Dache turban snood. Rather than letting the fabric keep it's fullness around the back of the head, it is gathered and tucked to give more shape. Something to try, perhaps. While I can't see exactly what is happening with this snood, this is the matching corduroy number I mentioned above. The photo appearing in a few country newspapers but the quality was pretty similar. It looks glam though! Not so glam, but still too cute to leave out. 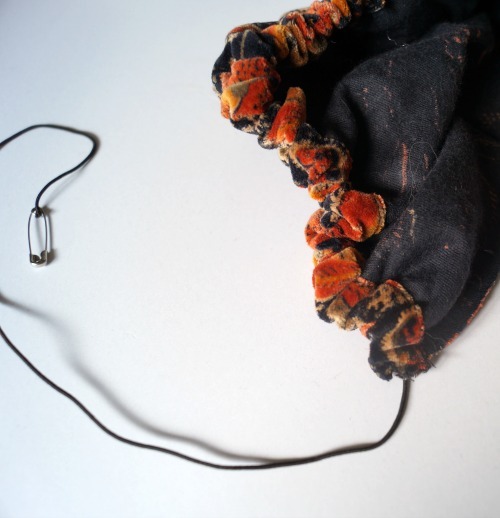 The more functional factory girl snood. 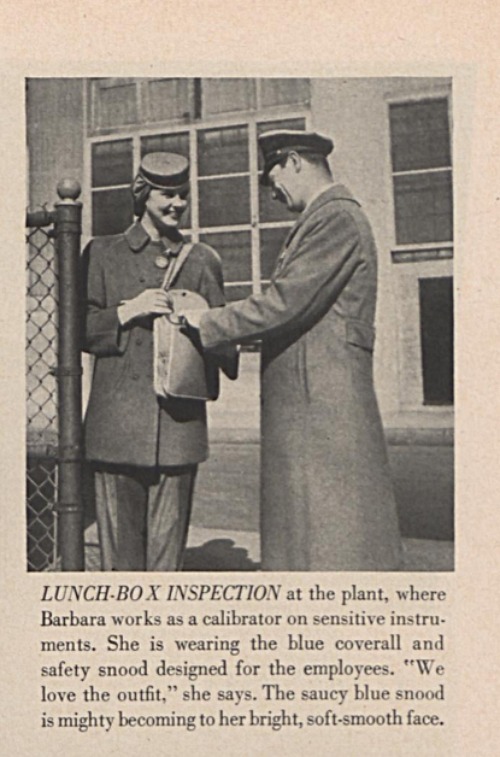 Also, what the heck is a lunch-box inspection? Next week we'll go through the making process, so find your fabrics and get ready! And let me know what you're planning! I was going to have these as separate themes but there weren't enough weeks in September! Since one of the pieces I am keen to create had both, together they went. I hope you'll join me for a week of playing with pretty bows and sparkly bling! 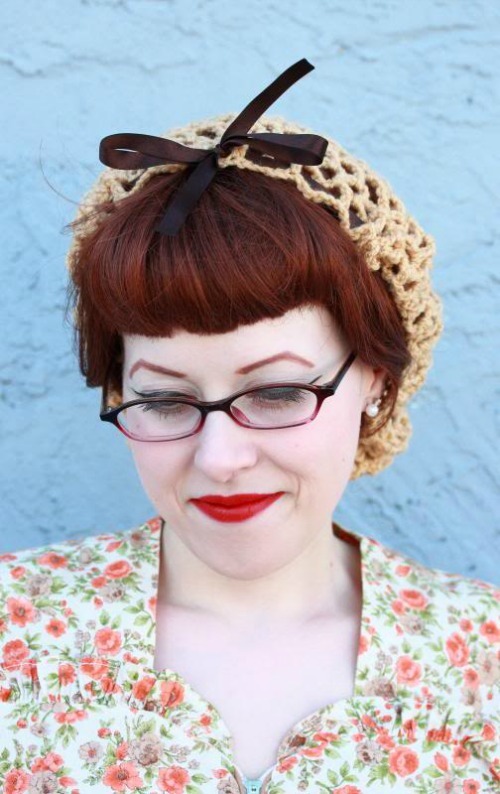 Often a crocheted snood will have a ribbon to tie it up, or in as a decorative addition while elastic holds the snood, so a ribbon bow on the top of the head is a classic choice. Let's explore some more ideas from the archives. 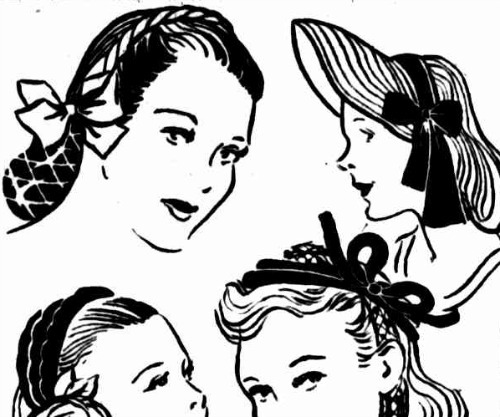 Bows at the sides, near the ears, are another easy choice. 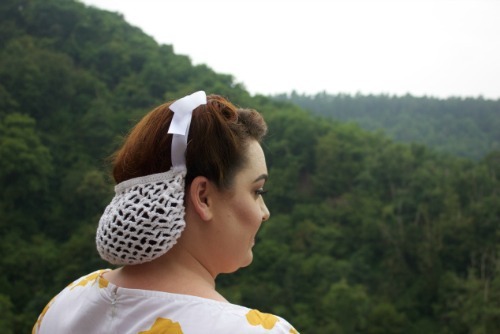 Just tie up your ribbon into a bow and slide a bobby pin over it and into place, or tie it onto the snood itself. I like the ribbon plait across the top too. This one, from the movie, Orchestra Wives, really inspired me. Honestly, on my small computer screen you can hardly even see the hair net, but on a large screen TV it looked like a fine net or veil half snood and it looked like it had sparkly bits in it too. As well as an oversized velvet bow, which can never be the wrong choice, I'm sure. "Scattered Bows. — It's so effective, this simple trick of dotting tiny bows about your snood. You need only 1/4 yd. of 3/4 in. ribbon to make each bow; 2 yd. is enough to cover an ordinary snood. Simply divide your ribbon into 9 in lengths, knot each into a tiny bow, and stitch each bow to a knot in the mesh at spaced intervals. It's a decorative idea that can be done equally effectively with big pearls, with artificial jewels, with different, colored ribbons or colored beads." Definitely one of the easiest options to try, and one you can easily attempt on your existing snoods and remove if you don't like it or want a change later. 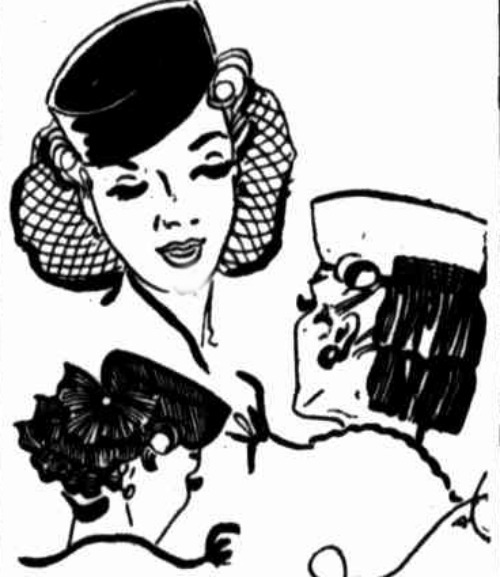 Another suggestion, from The Age, 09 Aug 1944: "...pert little bows of contrasting colored ribbon across the top of the head." No image, sadly. One of the ideas I'll look at more when we get to snoods with hats, it that sometimes it is not a hair-encompassing snood, but just the look of a snood, or enough to act as a bandeau to hold the hat on. 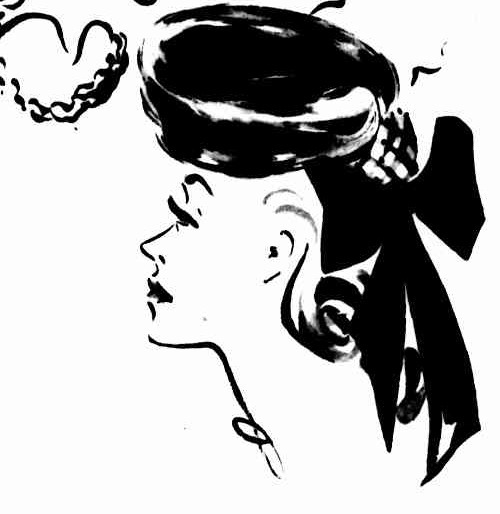 In this illustration, that seems to be the case, with curls of hair below the snood, and the big bow in between. Similarly, this is referred to as a snood, although it seems to be draping over the hair. 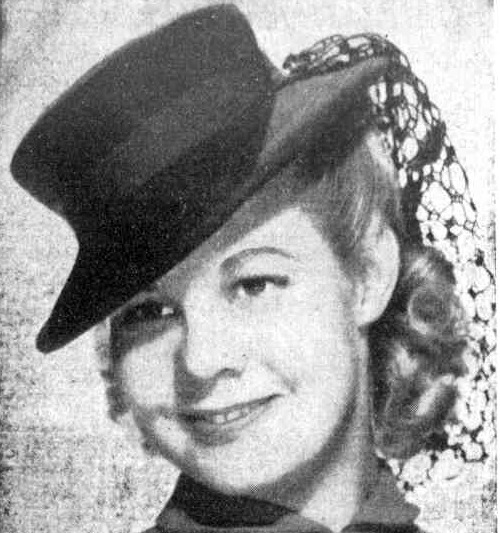 In any case, the caption says that it is knotted in tiny brown taffeta bows (the hat and net are also brown). It's time for some sequins, rhinestones, shiny beads, and sparkly accessories! "Another idea if your gown is black and diaphanous, wear a belt of gleaming black or midnight-blue sequins, and carefully sew matching sequins lavishly on the mesh of the black silk snood. You may think this rather a lot of trouble, but the effect is well worth it, and various ideas on the same lines may be adopted most successfully." This snood (and the matching gloves) is described as crocheted in white wool, sparkling with pearls, gold sequins and topaz coloured stones. "An exquisite custom for finishing a fascinating and gay model is the threading of pearls through the sequin snood. A pearl-studded comb - if you are fortunate enough to have such a thing - has infinite possibilities on a black or wine-coloured snood. Wear it placed at the stem of an artificial flower." What do you think? Are any of these ideas something you would try? It's easy to admire a vintage accessory or clothing style, but sometimes harder to imagine how to actually find a place for it in your wardrobe. 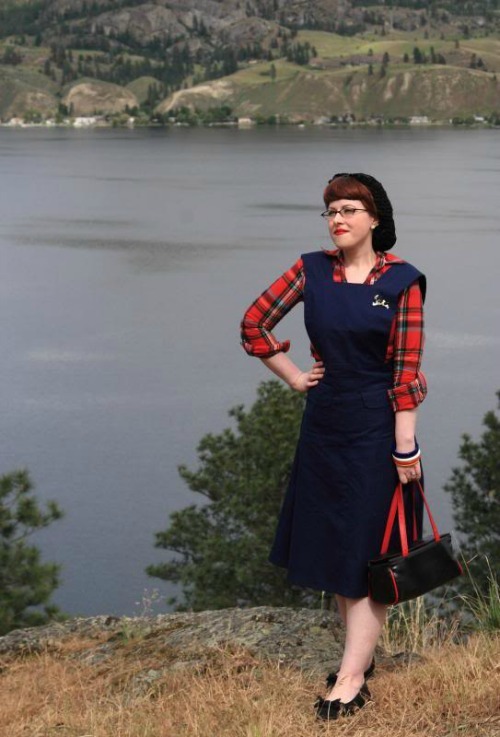 One of the lovely things about the online vintage community, is getting to see how other people are dressing, and get ideas for the pieces you want to wear yourself. 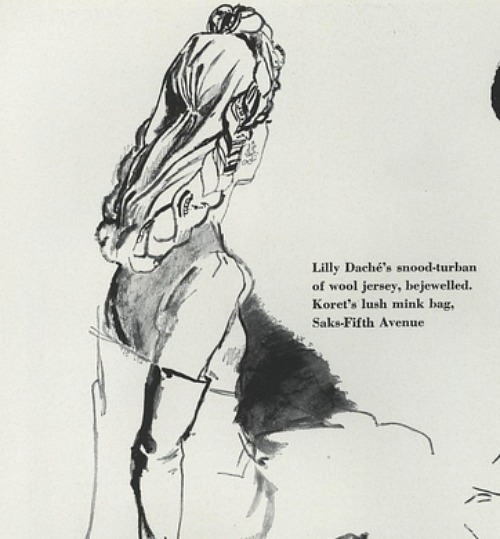 And although vintage images are great, highly-styled magazine images and fashion sketches dominate over photos of everyday people, and seeing clothing worn by a real person is a lot more helpful. 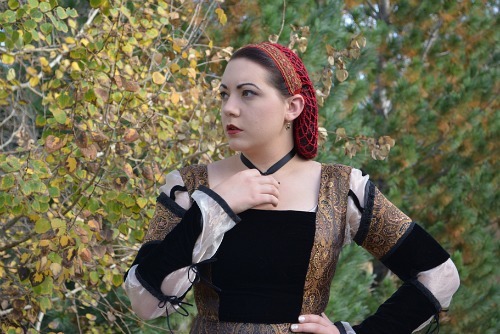 In the first Snoodtember post, I shared some links to advice on how to wear a snood and how to style your hair with them. Today we're going further with our inspiration, to look at whole outfits styled beautifully with a snood. I've tried to include a picture of the whole outfit, and often a close up or two so that you can see the hair details too. There are outfits for any season, from a range of colour palettes, so that whatever hemisphere you are in, you can find something to work for you right now. Many thanks to the lovely bloggers who agreed to let me share their images in this post. 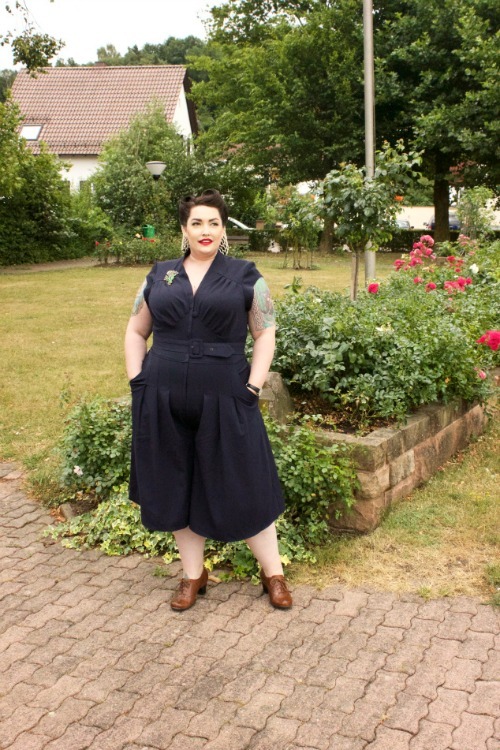 I've shared their blog links in the text so that you can check them out, and each individual photo is linked to the blog post for that particular outfit. 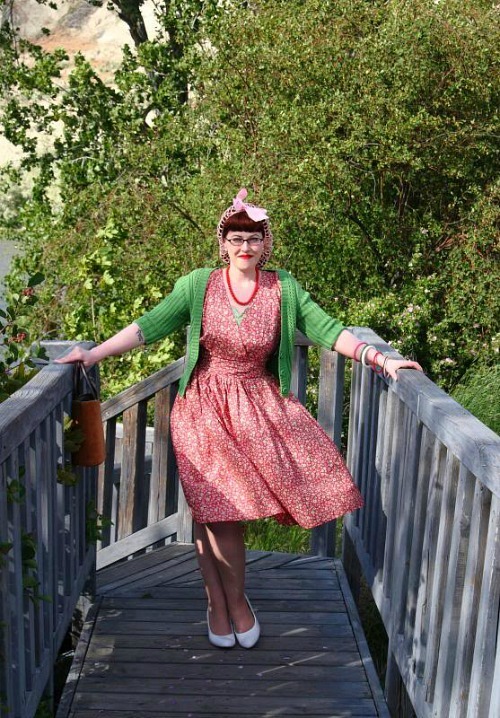 I'd like to start with Christine, from the blog Chronically Overdressed, otherwise known as The Glambassador. 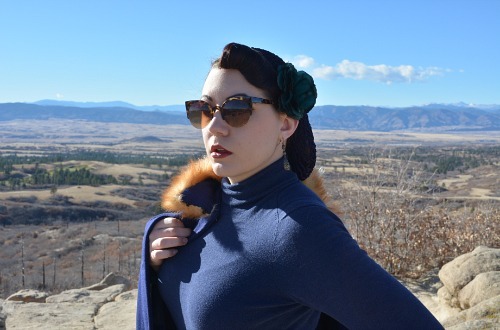 Christine is a frequent snood wearer, and always styles them beautifully with her outfits and with perfect hair! I also really love this dress silhouette with the snood. 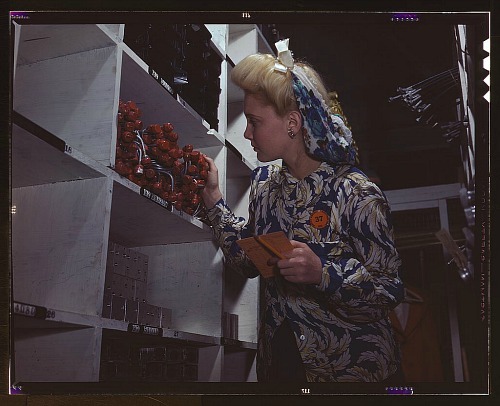 I love the way the red in the snood and her brooch (and lipstick) add bright spots to the otherwise darker outfit. 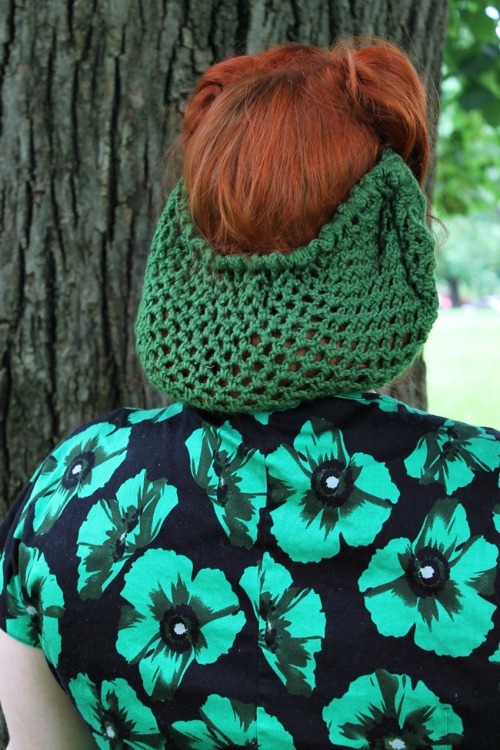 Here is the same flower, but with a different snood and different outfit. Now it's the white of the flower that matches the necklace and the details of the dress, while the blue of the snood coordinates with the dress. It's worth checking out the other photos from the post to see this look with a coat too. 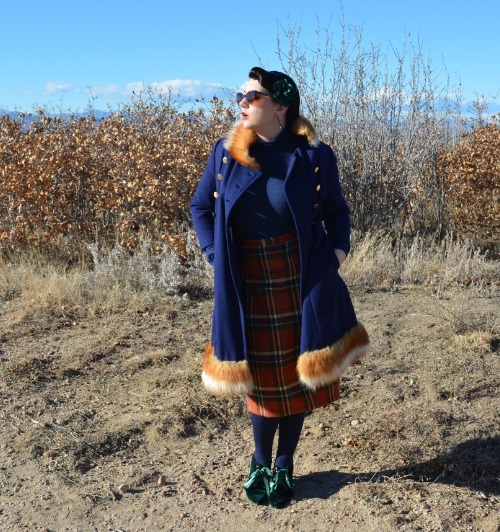 Vintage fashion blogs do tend to show a lot more dresses than pants, and when it comes to snoods that seems to be even more the case than usual! 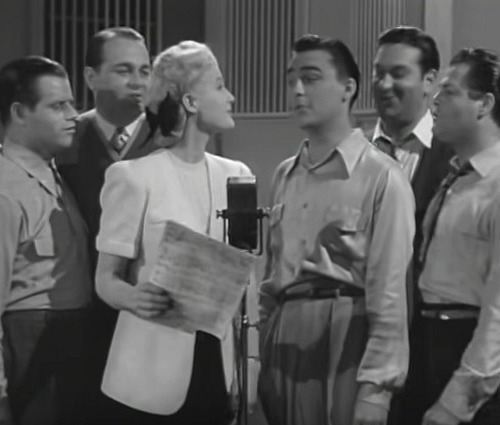 This play suit that Christine is wearing here is a lovely compromise, I feel. Look at those rolls! I desperately need to work on my hair skills. This next one is a lovely bright summer outfit, but my favourite thing about it is seeing one of those half-snoods in action. How cute is it? This style works beautifully with the cute rolls in front, and you can see why snoods were such a big thing for women with long hair, getting it off your neck and out of the wind, while looking as chic as can be. Next up is Bianca, from the blog The Closet Historian. 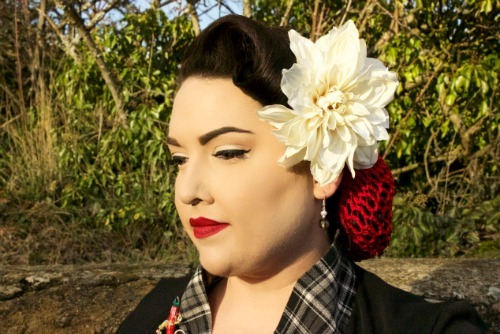 I knew I had to include Bianca in this post, and one of the reasons is that she has worn snoods in such a variety of ways, and with outfits inspired by more than just 1940s looks. 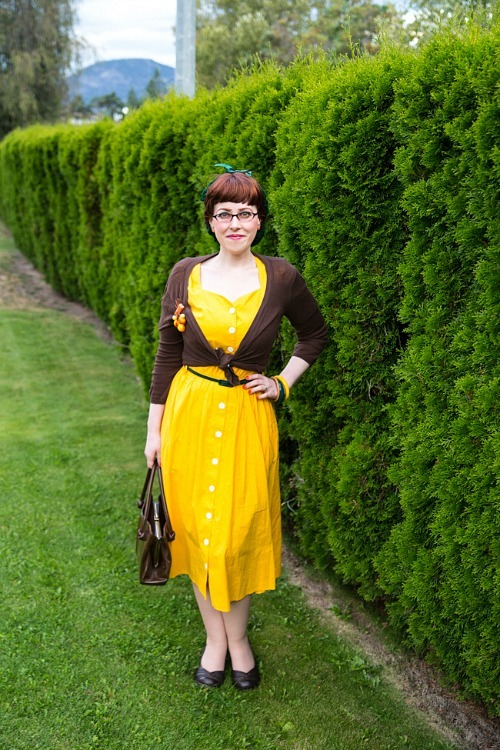 Let's start with mid-century vintage looks and go from there. The snood is subtle here, matching Bianca's hair colour closely, but it provides an added extra to the look (and I can imagine it might have been windy up on that mountain, so practical too!). This snood is also subtle, especially in a look that is already in black-and-white, but the fact that it is worn with a hat makes it so extra special! As you know, I've made "with a hat" one of the Snoodtember weekly themes, so I was excited to find a good example to inspire you all! 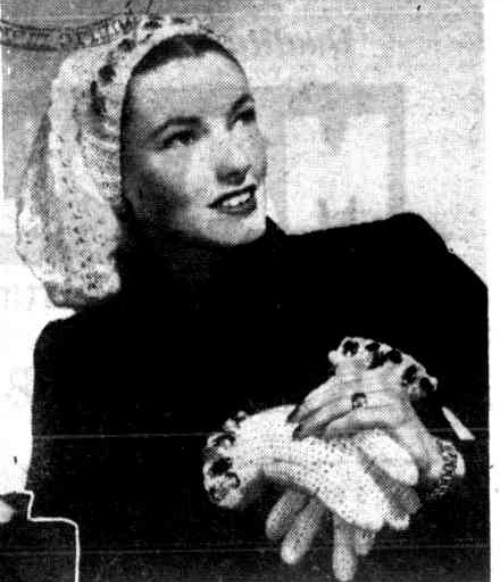 Snoods with hats are such a common look in the fashion magazines in the 1940s, but one that is rarely being worn these days by vintage fans. Bianca shows it is not only possible, but downright stunning! I remember when Bianca first shared her sketches for a series of outfits planned with a renaissance inspiration brought into a more modern outfit, and the results were fantastic. Snoods these days are most often worn with a 1940s-inspired look, they were around a long time before then, and I encourage you to explore those other eras for ideas. You don't have to design and make your own historically-inspired dresses as Bianca has done, (although, by all means do, because I'd love to drool over some more) but some details could be introduced in smaller ways. I love the look of the snood itself too, with the band at the front giving a nice detail. 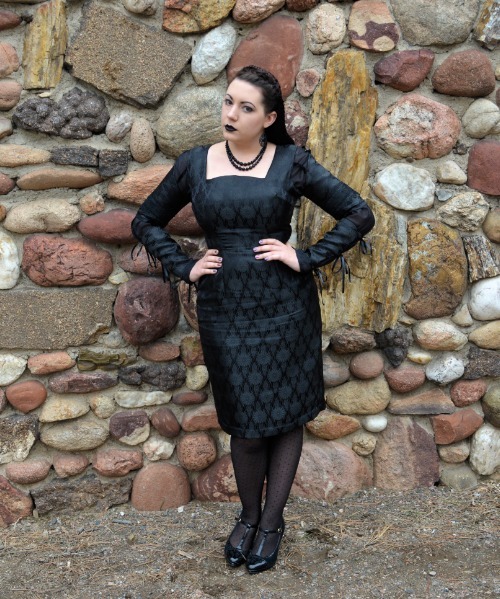 This outfit, another of Bianca's renaissance-inspired looks, is also not out of the question for those looking to express their love for gothic hints or Halloween vibes. The snood is barely noticeable from the front, but makes a lovely detail in the all-black ensemble. 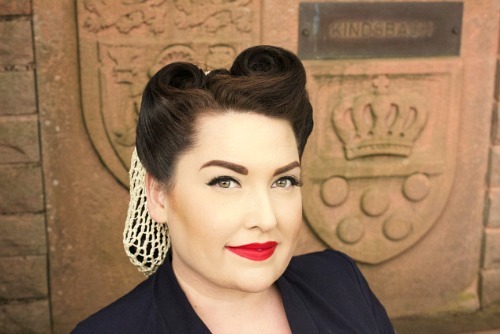 This, and all Bianca's looks, also show that you don't have to do victory rolls or have a fringe to wear a snood. 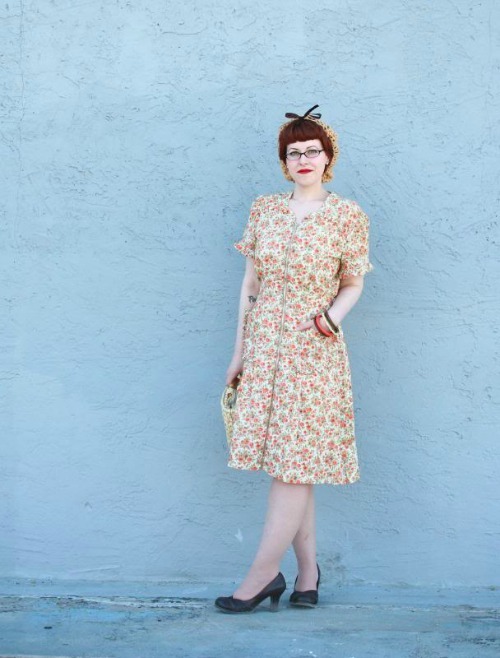 Next we have Jessica, of Chronically Vintage. Jessica is a big snood fan, and I delved right back into her blog archives to find my favourite outfits to share with you. I love this pink and green combination, with just the kind of "It's spring but I still need a cardigan" feel to suit the weather in my part of the world right now! 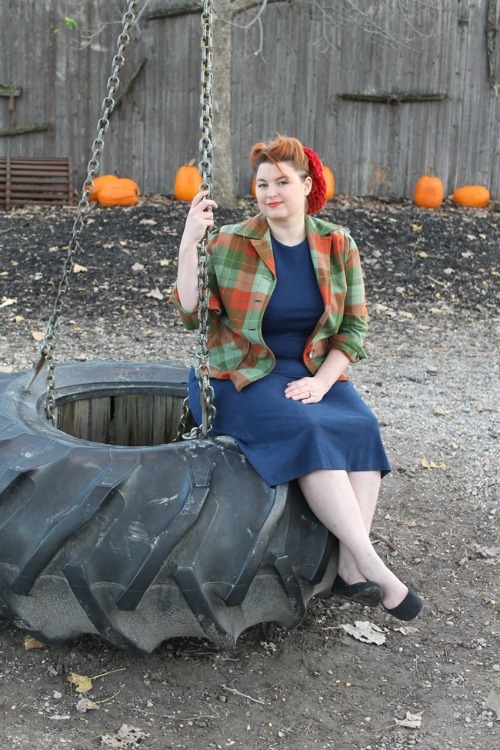 And this one, despite the more Autumnal tones, had me immediately contemplating where I could get a pinafore dress. Even though Jessica's hair isn't that dark, the black snood is still on the subtle end of the spectrum and pairs nicely with the crisp clean lines of the outfit. And they kindly took a photo from the back. Take note, fashion bloggers, more of this please, especially when hats and other headwear are involved! I love the sweet oatmeal colour of this snood with the soft charming colours in the dress. This seems like the kind of outfit that once you had it, you could just throw it on: dress, snood, bangles, done. I'm not sure this level elegance is really that effortless, but I like to imagine it is. Just as I was announcing Snoodtember, I saw this outfit post on Jessica's blog, and I knew I would be including it. Such a lovely combination of colours, and showing that the simple snood with a bow can be the perfect way to top off a vintage look. 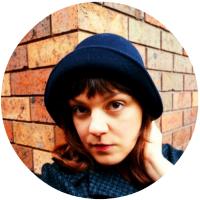 And last by not least, we have Brittany of Va-Voom Vintage, who is another long-time fan of snoods, and also a maker and seller of them (if you follow me on Instagram you'll soon be hearing some news from us!). I love these stunning greens on Brittany, and if you go through to her post she has a link to a video tutorial for the hairstyle too. I particularly love that she is wearing, as far as I can tell, a regular snood low down as a half-snood? I was wondering about trying this, and now I feel confident to give it a go! 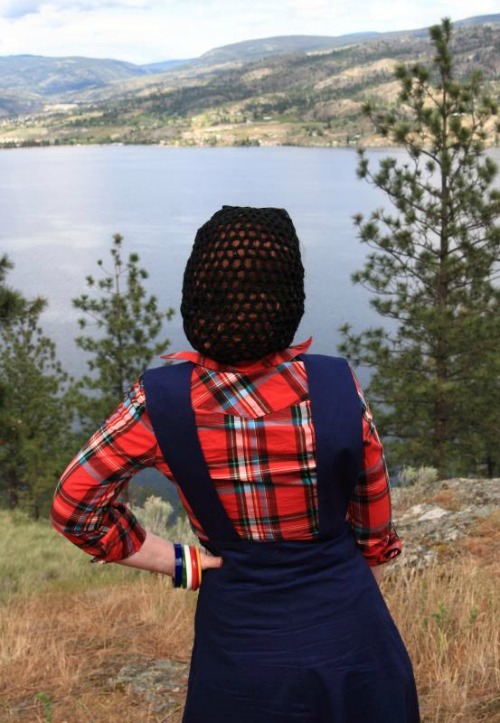 A classic Autumn look with plaid, dark blue, and a spot of red in the snood is hard not to love. Red snoods are so versatile and classic - I think I need to get one! Jeans at last! I adore this look. Fancy fair and a snood, with a more casual outfit that is still full of vintage vibes, from the turned-up jean cuffs to the plaid jacket. Once again, thank you to these lovely ladies who allowed me to share their images to inspire us all today and in our Snoodtember journey. 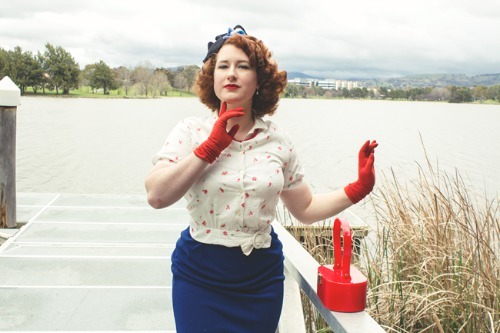 If you are feeling inspired but are short on snoods, don't forget that there are links to crochet patterns in the resource post and the special guest post reviewing free vintage Australian patterns. Or if sewing is more your thing, the fabric snood-along is starting later this week. (Or you can buy one from Brittany's Etsy shop, Tinsel Town Accessories.) Stay tuned!